Guaranteed Passing Result With More Than 90% Score In Fundamental Exam. Dealing With More Than 70 Clients Including Agency. Get Training From Google Display Certified (Gap - 3) Experienced Trainer. Very Few Trainers Or Experts In Market Is Display Certified (Level-3) Professional & I Am One Of Those. 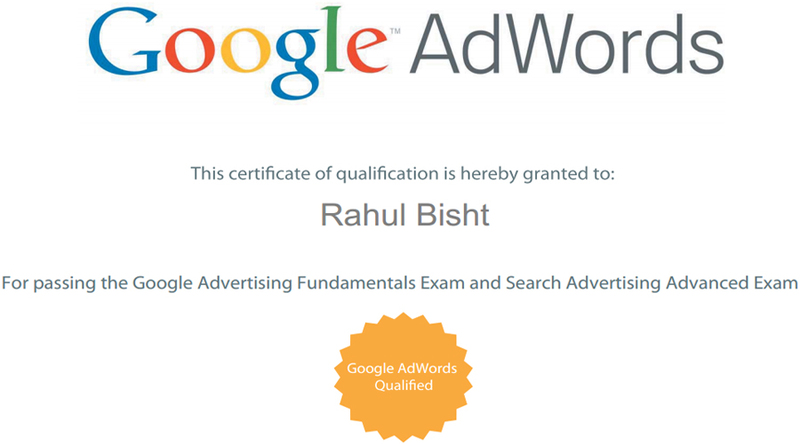 If You Are Doing SEM/PPC Course Please Make Sure That Your Trainer Must Be Certified In All These Domain. Because PPC/SEM Course Includes - Search Ads (Certification Required)+ Display Ads (Certification Required)+ Video Ads. WE KNOW A LOT AND ARE READY TO SHARE IT WITH YOU..! PPC or Pay Per click management is one of the most effective forms of Search Engine Marketing (SEM) used by web masters from to achieve quick results and high quality traffic for their websites. It is different from SEO as it is a paid program but it is highly result-orientated. In the online marketing industry, it is very important to learn the required and advanced tactics that makes a PPC Advertising campaign successful. Potential of ppc now a days is vast comparision to seo.Now a days this the highest demanding requirment of Corporate Sector. We teach you about adwords matrix but with that we will teach you others things which other institute is fail to teach you. 1. How You can earn money from website promotion. 2. You can promote 1 website multiple times on Google. 3. We will teach you adwords policy. So you can generate your own tricks. 4. How to check status of an account to make it run on Google Without Problem. Getting Started with Ad Words – How to set up account etc. The Ad Words Toolbox – Keyword Tool, Site Exclusion Tool, Ad Diagnostic Tool Etc. Facebook Promotion / Business page creation.